Skyline Cruises and Events can also provide our legendary New York event catering at your own location. We provide off-premise casual, formal or corporate catering services for all types of events. From gourmet food service to full event planning, we will execute your special occasion to perfection, from start to finish. Indulge yourself with our New York event catering services at your home, office or at any venue of your choosing both inside and out. 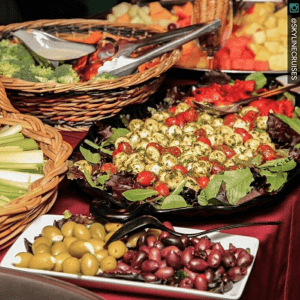 Skyline has been catering fine New York events of all types from formal elegant affairs to casual and fun parties since 1993 aboard the Skyline Princess, and now due to popular demand we are making our catering services, corporate, formal and casual, available off-premise. Let us plan the perfect event, from school events of all kinds, small private parties & family events to product releases, trade shows, and conventions. 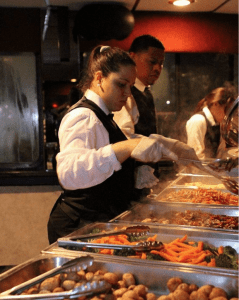 What Type Of Food Is Catered On The Cruise? We serve the finest, freshest cuisine on every catering menu – from formal buffets and banquets to the elaborate and elite. From brunch buffets to cocktail receptions, and everything in between, we have something to fit your needs. Each menu may be designed and customized to your specifications. Or you may use an outside catering service if you so desire. The choice is yours. When choosing Skyline Cruises you will experience class and professionalism. Our caterers will provide all the amenities and accommodations to make your catered cruise event a success. Whether you’re hosting a corporate event, a Bar/Mat Mitzvah, a Birthday Party or just a night out, Skyline Cruises has everything you need to make your night one to remember. Many people have always wanted the distinct pleasure of hosting an event on a luxury yacht but were put off by some of the challenges that are associated with a cruise. We understand that people have busy schedules, can’t always make it at a specific time or want the freedom to arrive and leave whenever they choose. This will also provide you the capability of having more guests attend as the yacht will not leave its’ port, therefore, guests can come and go for your entire event. Dockside Waterfront Catering on The Skyline Princess has all of the ambiances of a luxury cruise without any of the typical myths associated with harbor cruising. There is no need to fear unsteadiness or seasickness because you stay docked at the pier. Dockside Waterfront Catering gives you the best of both worlds! With many locations available in addition to our home port at the World’s Fair Marina in Flushing Meadows and its picturesque location. 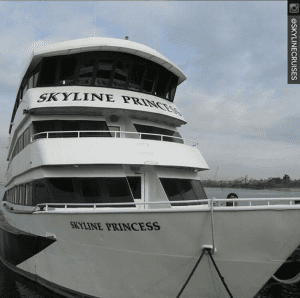 The Skyline Princess is the premiere site for your special affair.